Get inspired and create awesome designs with our fresh new templates including spring and Easter specials. Spruce up your social posts with Stencil's new templates. 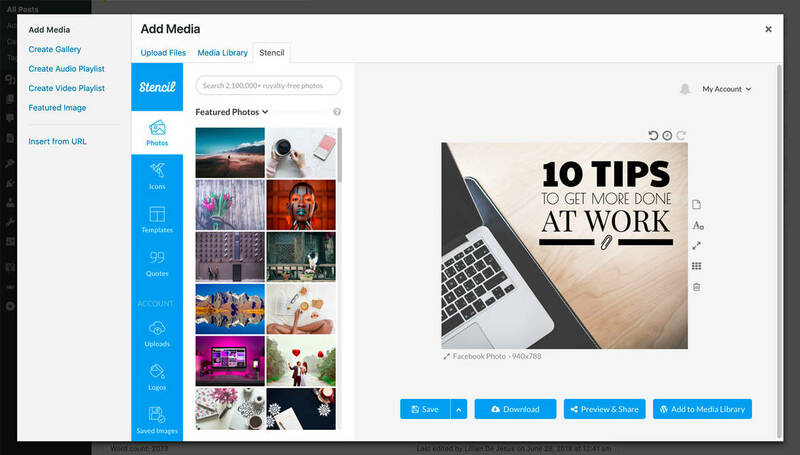 We've added 16 new design templates you can use to freshen up your social media channels. Stencil for WordPress is here! Our brand new WordPress plugin is now available, get it here! So long are the days of bouncing between tabs trying to find images when writing posts in WordPress. Now you have the full power of Stencil right inside of WordPress as you write posts. Due to a problem with our email provider, emails (including password recovery) were delayed. Everything should be working again now. SVG (aka vector) uploading is here! Now you can upload any SVG file (for example your logo), and use it in your designs. That means perfect scaling at any size! We've added more amazing templates suitable for social posts, business promotions, Instagram stories, and more. All new Google Web Fonts have been added, taking the total to over 2500! Make your images look better than ever with these amazing new font options. Pssst. There are new templates waiting for you. We've uploaded 16 new design templates including Youtube thumbnails, Facebook photo templates, Instagram story designs, and plenty more. It's been an extremely difficult process, but Stencil has finally been verified for direct posting to Facebook again! You can now post images directly from Stencil to your Facebook Pages. Note: As of August 1st, 2018, Facebook no longer allows direct posting to Profiles from third-party services. If you have Pages linked to your account, you can now post to those again directly from Stencil. Surely Stencil will start publishing changelogs very soon.